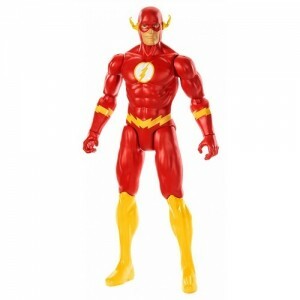 Help your comic book fan jump into the 'pages' with their favorite character action figures by their side. Whether you're an avid collector or just looking for the perfect gift, it's important to know that you're getting high quality figures and at the best price. With the toy video reviews below, you'll see be able to a full 360-degree view of the figure you're interested in, so that you know what you're getting is the quality you're looking for and can withstand 'heroic' or 'villainous' play for years to come. If you're not sure of the difference between collectible toys and ones meant for play, our videos cover that too. As you know, collectibles can get expensive which is why we built a regularly updated price comparison engine to help make sure you're getting a great deal while saving time researching. Get ready for some comic strip fun with this Disney Princess Comic Collection from Joe Books series. When shopping for your favorite comic book character, it's important to know the lingo to make sure that you're getting exactly what you want. This 'lingo' focuses on one of the most important aspects of the action figures, their size. Knowing the terminology will make it easier to determine if you're looking at a life-size collectable or an articulated 6-inch figure perfect for playtime. The sizes for these particular types of toys are listed under a scale reference. Toy companies and collectors use these scale figures to refer to the toy's size ratio, making it easy to know exactly what you're getting without having to break out a ruler. These ratios are based on an average human height of six feet, think bigger than life characters like Batman, Superman, and Darth Vader. By using the sizing terminology when speaking to other collectors, or on the packaging, you can say that you just added a 1:48 scale Black Panther to your collection and they'll know that you just got an awesome LEGO minifigure. Or you can call a shop to help your upcoming action hero a toy that is the right size for them. Something to think about when purchasing action figures, is that as the size increases so do the details. The larger a figure is, the more room it has for those life-like features, which can be a big factor when considering the quality of the character. The last thing to consider is if it is going to be used for play. If it is for a small child to play with, you'll want to avoid expensive and detailed options with removable parts that could be choking hazards. If it is for a teen who is adding to a collection, look for terms like NRFB or never removed from box. This means the figure is in pristine condition, but that doesn't mean the packaging is perfect. Shopping for collectibles and hard to find toys isn't always as easy as taking a trip to the toy store, especially when you're searching for something older and rarer. So where do you go to find these titans of treasures? There are a number of avenues that you can take, in the real world and online. Some of your best bets in the real world are to frequently check out vintage stores, estate sales, and toy resale stores. If you've scoured the shelves at all of the antique shops in your town and still aren't finding what you're looking for, the internet is your next best resource. •et; Comic conventions - you can check online which sellers will be at the conference ahead of time, then connect with them for a list of their inventory so that you can come prepared to purchase upon arrival and avoid shipping costs. With the help of TTPM's comic book action figure reviews and price comparison tool, adding value as you add to your collection or finding the hero to make playtime more fun while saving money has never been easier.